American Theater Company (ATC) proudly announces Season 32, led by its newly appointed Artistic Director Will Davis and continuing the theater’s dedication to developing new works. The 2016-17 season kicks off this September with the world premiere of Dan Aibel’s T., an exploration of the competitive ice skating saga between Nancy Kerrigan and Tonya Harding, directed by Margot Bordelon, Sept. 23-Oct. 30, 2016. In the New Year, ATC presents Jaclyn Backhaus’ Men On Boats, making its regional premiere at ATC Jan. 6-Feb. 12, 2017, under Will Davis’ direction after he remounts his acclaimed New York production Off Broadway at Playwrights Horizons this summer. Next spring brings another world premiere at ATC, Basil Kreimendahl’s We’re Gonna Be Okay, March 17-April 23, 2017. The production is directed by Bonnie Metzgar and was originally developed at ATC in collaboration with The Araca Group during AracaWorks: Chicago 2015. The final production of ATC’s 2016-17 Season is a reimagined classic, Pulitzer Prize winner Picnic by William Inge, under Davis’ direction May 19-June 25, 2017. Season subscriptions are on sale now and range from $60-$150, with special pricing available for advance purchases before July 31, 2016. To purchase a subscription or for more information, visit www.atcweb.org or call the ATC Box Office at 773-409-4125. ATC also announces a new season-long partnership with Chicago Inclusion Project, whose work creates inclusive theater experiences that bring together Chicago artists and audiences normally separated by physical ability, gender identity and/or ethnic background. The two companies will partner around casting for ATC's Season 32, giving diverse theater artists access to roles they might traditionally have been excluded from. Together with the Chicago Inclusion Project, ATC will continue its commitment to presenting works that boldly reflect the diversity of stories and experiences in America today. 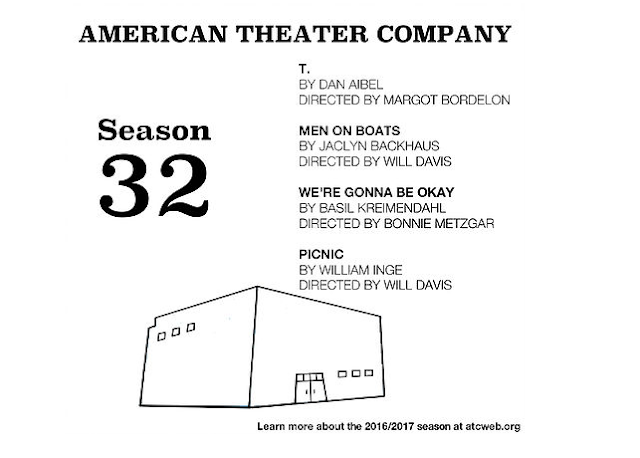 ATC is offering the new American Membership in Season 32 for $150, which offers the member a reserved seat at each production in the season. ATC is transitioning to general admission seating in Season 32. Under 35 Memberships range in price from $60-80. Early Bird 3- and 4-ticket subscriptions range in price from $90-$120 and are available until July 31, 2016. Regular subscriptions range in price from $105-$135 and are available Aug. 1-Oct. 31, 2016. All Memberships allow you to choose your performance dates upon purchase. To purchase a subscription or for more information, please contact the ATC Box Office at 773-409-4125 or visit www.atcweb.org. Mag has a horse inside her, the spirit of a horse anyway. It’s the Cuban Missile Crisis, and President Kennedy said that “…the greatest danger of all would be to do nothing” so Efran and Leena and Mag and Sul are thinking about doing something big. Two families wrestle with macrame, female empowerment and a shared property line in Basil Kreimendahl’s We’re Gonna Be Okay. Bonnie Metzgar directs this world premiere play first workshopped through ATC’s partnership with The Araca Group (Disgraced). Basil Kreimendahl is a resident playwright at New Dramatists. Basil’s plays have won the Rella Lossy Playwright’s Award and a National Science Award at The Kennedy Center. Basil has had a Jerome Fellowship and a McKnight Fellowship from the Minneapolis Playwright’s Center, and an Arts Meets Activism grant from the Kentucky Foundation for Women for theatre work with the trans community. Orange Julius was developed at the O’Neill National Playwrights Conference, included in La Jolla Playhouse’s DNA new work series and The Kilroy’s List. Basil was commissioned by Actors Theatre of Louisville for Remix 38 in the 2014 Humana Festival of New Plays. Basil's plays have also been developed or produced by New York Theatre Workshop, The LARK, ATC, The Playwright’s Center, Victory Gardens, About Face Theatre, Actors Theatre of Louisville, Inkwell, Rattlestick Theater, Labrynth Theater, and The Oregon Shakespeare Festival. Basil’s work has been published by Howlround, Dramatic Publishing, Playscripts, Inc., and included in Xlibria’s Becoming: Young Ideas on Gender and Identity. MFA University of Iowa, 2013. Bonnie Metzgar is a Chicago-based playwright, director, dramaturg and producer. Recent directing credits include American Theater Company’s production of Let Me Down Easy by Anna Deavere Smith, The Secretaries by the Five Lesbian Brothers at About Face and Walk Across America for Mother Earth by Taylor Mac for Red Tape as part of the 2015 Garage Rep at Steppenwolf. She is currently writing a commission for Sideshow Theater’s Freshness Initiative and was a member of the Goodman's 2014-15 Playwrights Unit. From 2008-2013, Metzgar served as Artistic Director of About Face Theatre and was proud to work on behalf of LGBTQ artists at a theater dedicated to advancing the national dialogue on sexuality and gender. In 2013-2014, Metzgar was awarded the Carl Djerassi Fellowship in Playwriting at the University of Wisconsin, Madison. Her plays have been finalists for the Eugene O’Neill National Playwrights Festival, and selected for the Great Plains Theater Conference in Omaha. Previously, Metzgar produced the 365 Festival with Suzan-Lori Parks and was Associate Producer at the Public Theater where she founded Joe’s Pub. Metzgar is on the National Advisory Committee for Howlround and has taught at a number of universities including Brown, University of Chicago and currently at Purdue and DePaul. She received her MFA in Playwriting from the University of Iowa and her BA from Brown. The Chicago Inclusion Project is a collective of artists, committed to creating inclusive theater experiences by bringing together Chicago artists and audiences often separated by ethnic background, economic status, gender identity, physical ability and countless other barriers. By deliberately choosing the unexpected, both in play choices and non-traditional casting, cultivating a diverse audience by bringing new combinations of artists to as many communities in Chicago (and its surrounding suburbs) as possible, choosing facilities for the multiple projects that are handicap accessible and keeping price of tickets affordable, The Chicago Inclusion Project programming aims to unite diverse collections of Chicagoans. For more information, visit www.thechicagoinclusionproject.org.